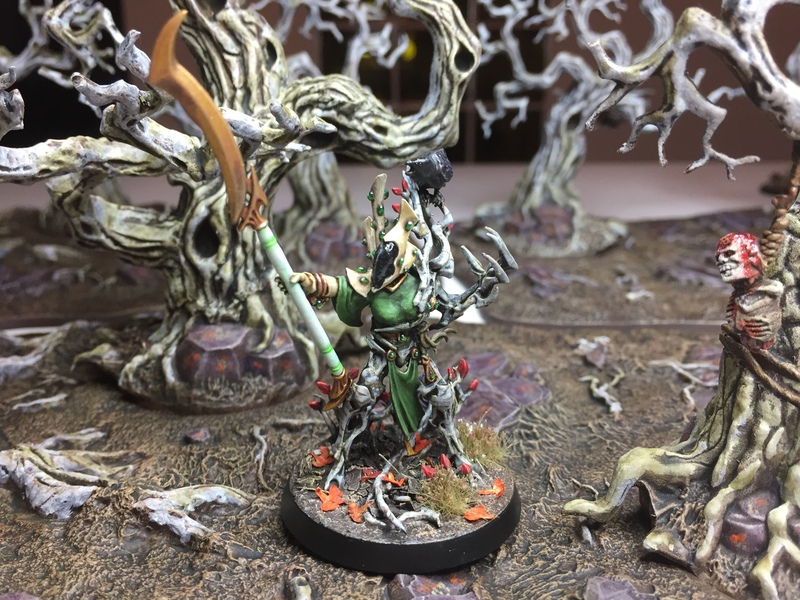 I am particularly pleased with my attempts to turn the male Spiritseer into a female – one thing I really wanted to do in my warband was to take advantage of the lack of gender bias in Eldar lore and have some really strong female characters. I’m chuffed with my attempt to sculpt breasts – hopefully they are realistic and not in any way crass. 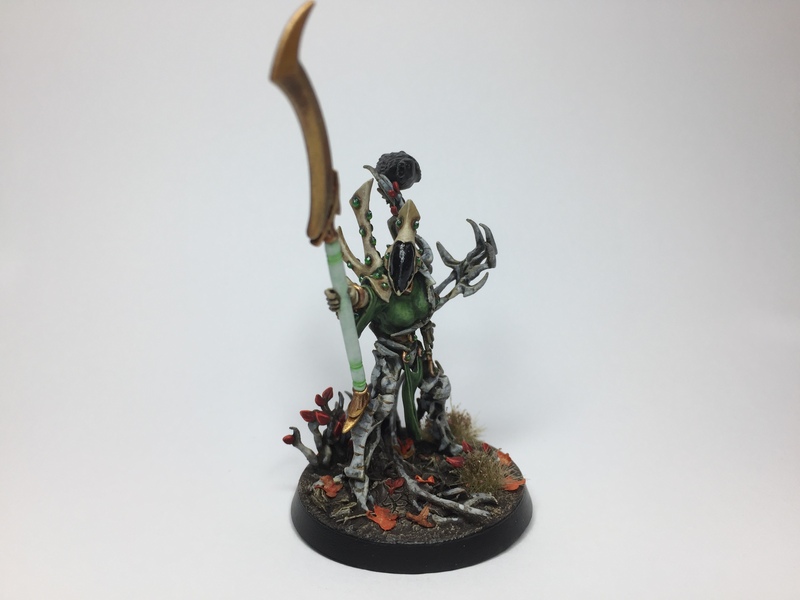 I stuck with a very restricted palette of whites, greens, gold and bone for Lindethiel – a scheme that I intend to carry throughout the warband. 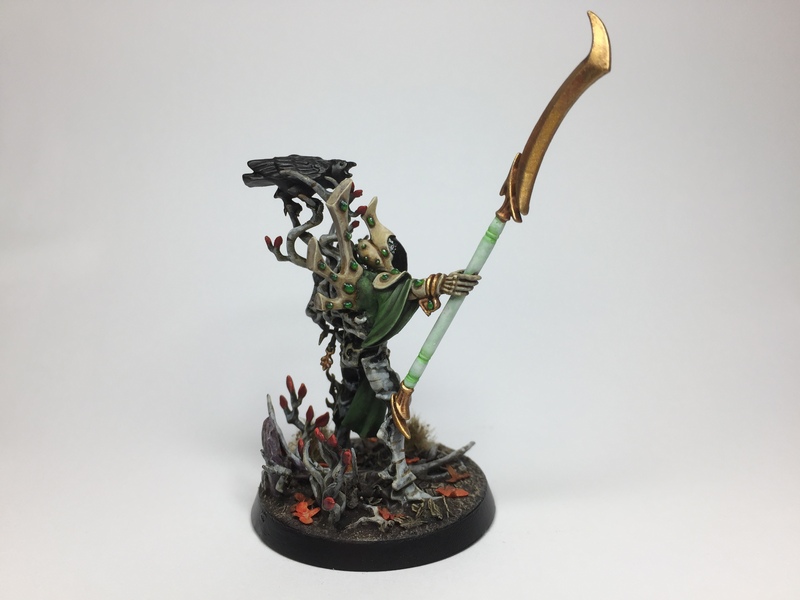 I really like the interplay of this scheme – the bone suggests death while the green speaks of life, and the gold and gems suggest a grandeur that is offset by the faded and tired looking white of the silver birch. It is far more of a fantasy palette than a sci-fi one really – perfect for Exodites, and I think the crow really adds something in that regard as well. Lindethiel Gladesinger slept deeply, her thoughts slowing as they weaved through the vastness of the wraith-realm, lulled by the quiet insistence with which it called to her. Her dreams carried her far and wide, deep and high, as she tasted the rivers of sap ebbing and flowing through the forests, heard the echo of crystal caves that no mortal eyes would ever see, swam deep in underground lakes of icy vastness, listened to the scurry and struggle of life in all its forms… Beneath all of this pulsed the fiery molten ocean at the heart of the world – a steady throb of life force that resonated throughout the planet. The harmonies were beguiling, rising and falling with each languorous turn of her awareness, the soothing melodies running counterpoint to the primordial undertone. The wraith-realm sang its sweet song to Lindethiel, calling on her to merge her consciousness with the spiritual gestalt that included the very soul of this world, as well as those of her ancestors. Her life had been one of long service to her people, and she was now ready for peace. Deeper and deeper she drifted, her thoughts slowed and were gradually subsumed further into the world spirit, just as her body was slowly absorbed into the sacred forest grove of her people. Day? Weeks? Months later? It didn’t matter anymore. Her drifting had taken on a timeless quality, and Lindethiel was barely aware of herself as her merging approached completion. Suddenly, a discordant note plucked at her fading consciousness – a single tone that rang false in the greater soundscape of the world, arresting her descent into oblivion. A sense of wrongness bled into the spirit realm, changing the serene beauty to something sinister and fearful. Lindethiel felt her individuality increasing as the world spirit began convulsing, pushing her back towards consciousness and the world of the living. She gathered her identity with a sense of resignation as she rose through layers of her own awareness, sending strands of consciousness out into the world, seeking out the source of the discord… She soon found it – a stream of psychic defilement that emanated from the hidden webway that connected her world to the wider Eldar diaspora. It spread like a bruise, corrupted like an infection, and it defied all of Lindethiel’s attempts to comprehend. At first she feared it might be the taint of chaos, but this was unlike any daemonic incursion that she had ever experienced… this felt older, and it didn’t have the distinctive emotional drives of the great powers… no hunger, no lust, no malice or rage, no urge to corrupt or enslave… the only emotion that she could perceive was one of utter despair, and an overwhelming sense of nihilistic futility… Lindethiel could only conceptualise the incursion with one word – ‘Ending’, and she knew that her world and her people were in dire peril. Reluctantly, she forced her consciousness back towards her body. Lindethiel awoke. It took her a few moments to adjust to her return to consciousness. She would have fallen, but her body was already in an advanced state of petrification, and she remained rooted to the ground. Just like her ancestors before her, she had come to the sacred grove to pass from the world of the living. The process saw the physical body transform into Wychwood, while the soul travelled through the psychically conductive medium to join the world spirit. 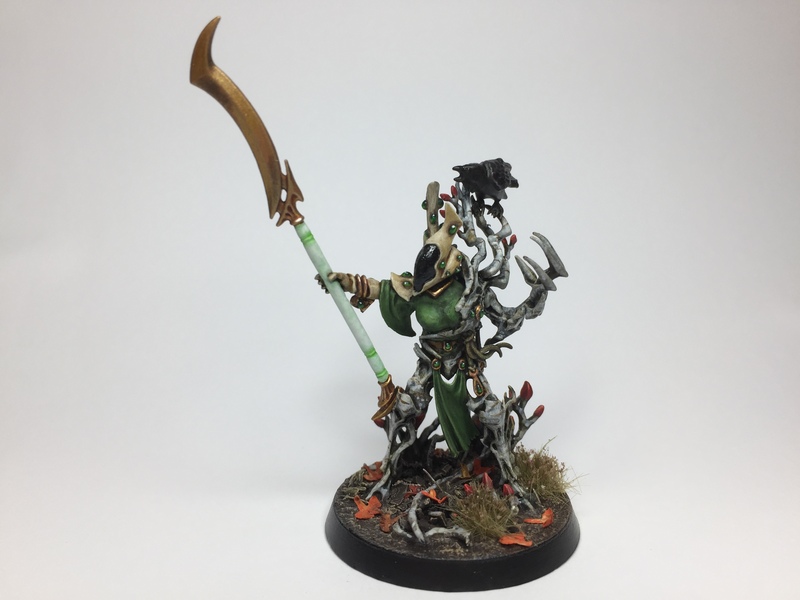 In many ways, Wychwood served her people in the same way as the Wraithbone of her Craftworld kin, indeed, this natural repository for the souls of the dead was probably one of the reasons why her ancestors had chosen this planet to be their Exodite home so many generations ago. Now, drawn back to physical life and torn from a deeper spiritual existence, she stood in the dappled shade of the sacred grove, the majority of her body already turned to psychically responsive wood. Lindethiel was unconcerned by her altered state. She had trained and mastered the way of the Shaper throughout her long life, and was able to mould the material to her will with the merest thought. In emergencies, she could even use the wood to create body-constructs capable of being inhabited by the spirits of the dead, so it was no effort to animate the parts of her body that had become petrified. She’s a beauty mate. I love the gems, the colour palette and the crow is a cool little touch. I really nice and clever combination of bits too. It’s dinner time in my household, Pork roast mmm, so I’ll be back for the fluff a bit later. Again, very nice work pal. Bravo on the story my friend. Sorry I didn’t get back until now. You have a real talent for words and storytelling man. Have you ever, seriously, considering writing a book? You and Wudugast could do a joint project of tales. Maybe tales from the Albino Woods. Again, very, very good Alex. Love the background, mate! A joy to read. The model is a smashing, really great. Don’t worry ’bout the sculpting, it is subtle and believable. Far from the boyish fantasies of say Toughest girls in the Galaxy (sigh, how I loath that range). The green might lack a bit of depth (or it’s just the photos). If you think so, try a mix a little red wash into the recesses. It does wonders. Red on green and vice versa is a weird concept but it really works. I forgot to mention the staff. Very cool, pale green colour. Made me think of marble stone. Beautiful work on her and a really cool concept with the spirit wood. The contrasts between the textures and colors worded really well. Thanks Joe, nice of you to say mate :-) I must confess, the texture on the wood is probably my favourite bit of the whole piece! Love it! Perfectly captures the “Space elf turning into daemon tree” look you were going for. Seriously, it’s simply perfect, you achieved your goal in all its full extent. Bravo!! Excellent stuff Alex. I like the gem choice – the fresh green (new shoots?) colour is a nice point of distinction from the darker green robes, without pulling away from the overall naturalistic colour scheme. The conversion is brilliant – seamlessly blended between the various elements. I like the fact this this is a nod to the crystal seers of the Craftworld Eldar, but in a more earthy fashion! Hey, thanks for the kind words Jon – the crystal seers idea has been buried in my memory for many years, and definitely informed the concept for this piece :-) I’m glad you like her mate. Brilliant work mate, really interesting concept that you carried to completion well. The gems look good. Thanks dude, and more there shall be! Absolutely amazing, great work with concept, background and execution coming together so seamlessly and convincingly. The birch bark is particularly lovely. It’s the most elvishly haunting of all the barks. Great stuff mate – the conversion, the painting and the story are all outstanding. It’s taken me a while to find the time to really sit down and look at her and read the piece you’ve written but it was well worth the wait! Fantastic work, Alex. The paint really brings the conversion to life. The choice of silver birch for the wood is an excellent one, as it fits in with the Eldar look well while still reading as wood, while also having both an ethereal and a naturalistic feel. Great work!